Looking for a new collar design? 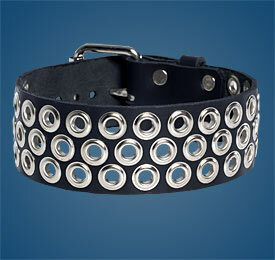 Check out our new grommet collar! This heavy-duty collar features three rows of grommets and a buckle in the back. These are handmade locally just for us from 100% black leather to stand up to use and abuse. Check out the matching bracelets, too. The collar is 1-3/4" wide and fits necks 12.5" to 17.5" around, and as with all our leather products, will soften with wear and handling.